Delta Phi Epsilon has taken direct action in the wake of a racist video posted on social media by a member of the sorority’s chapter at William Paterson University. The organization announced Sunday that the student will be disaffiliated. 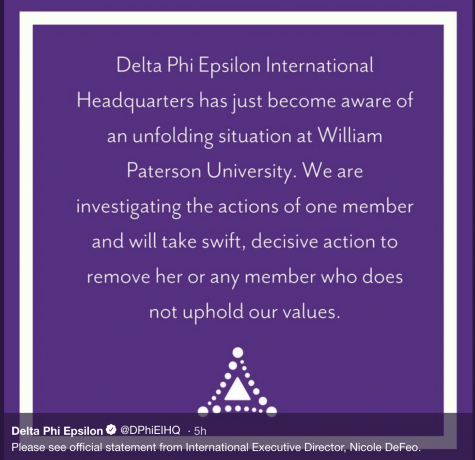 Nicole DeFemeo, the International Executive Director for the Delta Phi Epsilon International Headquarters in Philadelphia, Pennsylvania, didn’t learn about the video, which showed William Paterson student Jasmine Barkley and a Penn State University student using racially derogatory and sexually explicit language until late Sunday morning. It didn’t take long for her to realize that swift action had to be taken. She noted that Delta Phi Epsilon believes in both social justice and due process, fully investigating any and all components of a situation like this before applying its own values. If a person doesn’t align with these values, they are removed from membership, which is what happened in this case. “Our organization was founded by five Jewish women in 1917 who were discriminated against, and so we take that very seriously,” she said. The decision was a separate internal process, but DeFemeo said that they’ll be in contact with William Paterson University as soon as it opens tomorrow morning. The organization will try to figure out what it can do to prevent people like Barkley and others from getting in to begin with. DeFemeo believed that this can only happen through education and taking up the cause.